– and possibly an epiphany. You can buy all the yarns and keep them ready. 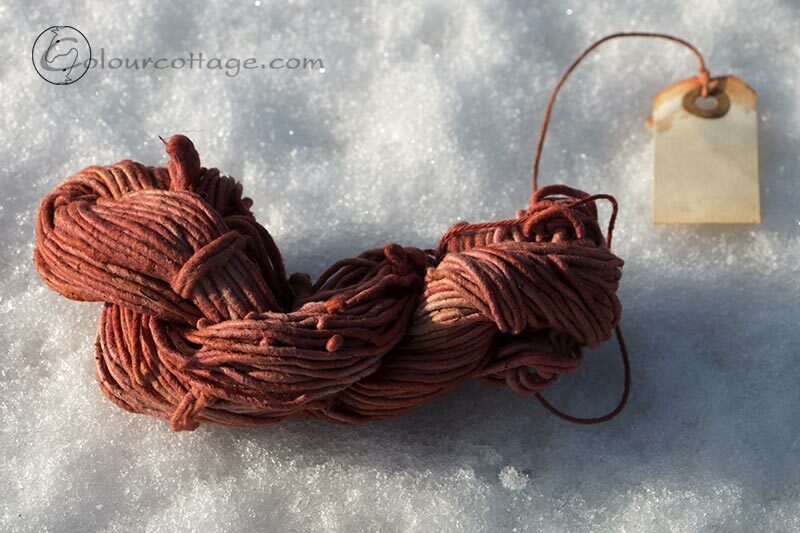 Make that plan in advance which projects do you want plant dyed yarn for and just buy those. Not decide until the last minute, meaning you might miss season for the plant you wanted and have to wait a year unless you froze or dried some. Just buy whenever you feel like it and use the plants available at the time. Option #1 would be awesome and very expensive obviously, #2 is very difficult for me because I have a habit of changing my mind – I do have some stash that I’ve lost interest in before I got around to “the plan”. #3 is a tiny bit stressful when you realize what you would have liked to do round about a month ago. 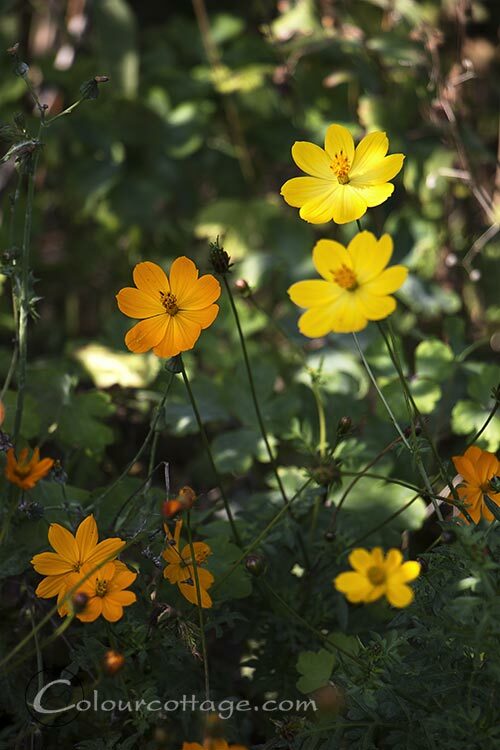 One of the plants I’d wanted to try this summer was the cosmos sulphureus. But it was a very dry summer, I was not very garden fit, so I didn’t think any of my seeds sprouted – until late summer a few of them did. So I carefully picked flowers every day and saved in the freezer. Still only a handful, but enough for a small test at least! 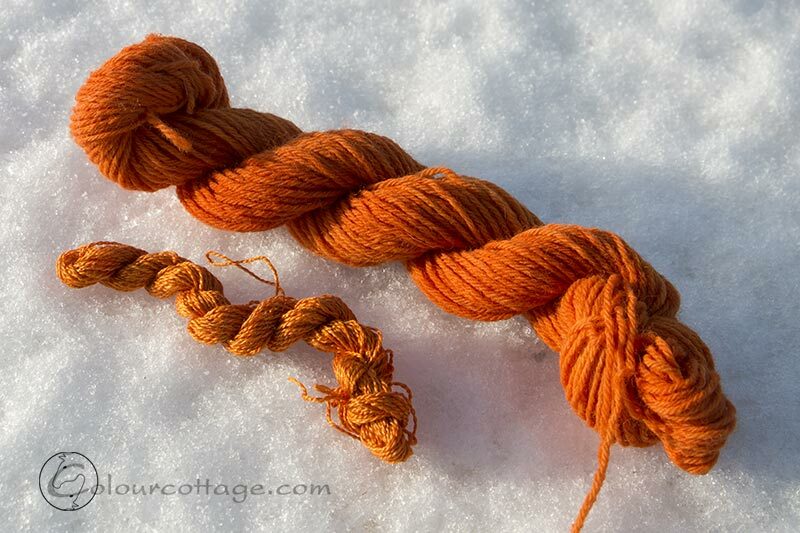 Just your average alum mordant – wool and silk. 25 g + 3 g, 60 g flowers. 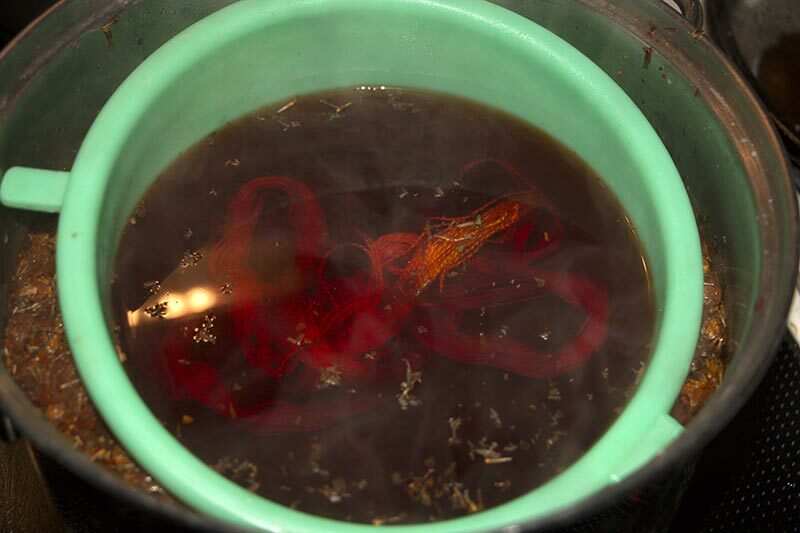 If you tip frozen flowers into boiling water they release dye instantly, so the whole thing only took half an hour! I just left the plant bits in and inserted a sieve with the yarn inside to filter the worst. Turned out I only had one alum skein of wool, but I wanted to test the exhaust, which was bit paler than before. 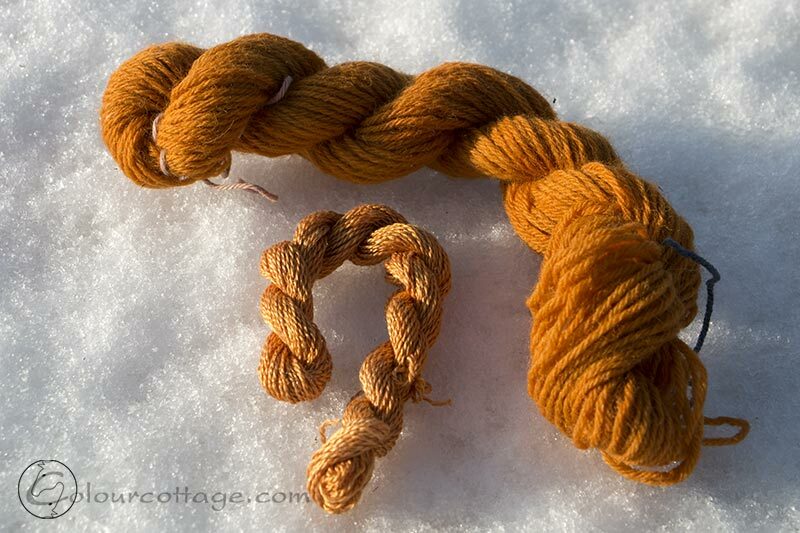 So in went another silk + a copper mordanted wool. The difference between cosmos and coreopsis seems to be that the former gives paler shades of orange, while I’ve had bright yellow from the exhaust of coreopsis as if the red dye strikes first. Interesting! The copper has saddened the tone just a bit, but not much. Now the bath was really pale, but I was not done testing, so I added pot ash to make a very alkaline solution. Boom! I’m sorry I didn’t take a before photo, but I hadn’t expected this radical change! So in went the last of my 2013 failed cotton skeins – which I STILL haven’t told you about, so don’t go looking in the archives. See, I’d read something recently that made me realize one crucial point of cotton dyeing that I’d completely overlooked. The pH. I know cotton likes it high and wool the opposite, but had focused on the mordanting and scouring, not the dye bath itself. It gives me hope for new leaf prints too. So at least I have part of a plan: I do want to get more cotton yarn to plant dye, not just wool. 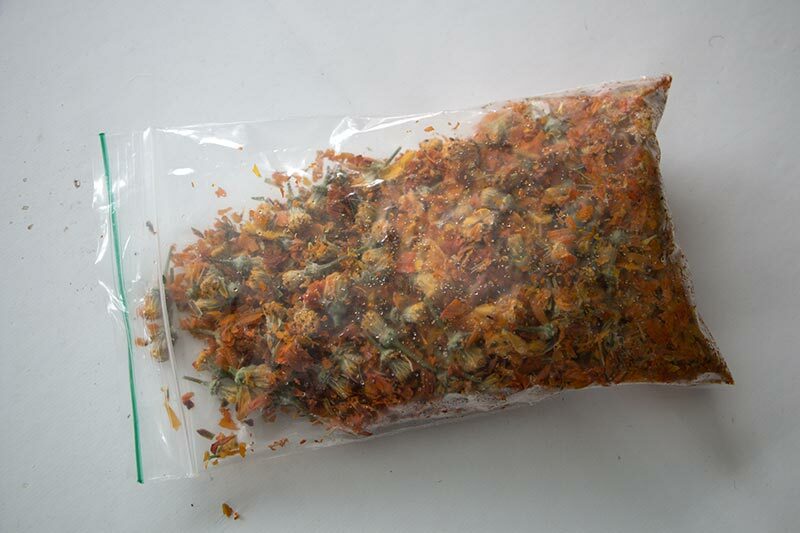 I’ve used the alkaline extraction of dye before, it works a treat on yellow dyes, such as birch leaves and many others. What you do is add it while it’s hot, and when the dye bath has cooled the pH has gone down enough to be safe for wool. This time I used A LOT though, and the day after it was still in the blue-green range (I could find a strip but not the reader – but I’m guessing around 9). But it’s still really, really dark, so I’m going to save it a bit and then try another silk in there if the pH goes down far enough. The dyed yarn looks almost like the flowers. Great vibrant colour. i’m amazed that you got such significant depth of colour from such an insignificant amount of petals!! lovely! Tak for farver med knald på. På en grålig eftermiddag er den slags helt essentielt! … og jeg bruger selv en krydsning af lødsning #1 og 3. Jeg køber garn – i tide og utide – men kun på genbrug eller på tilbud. Alt det, der er beregnet til plantefarvning, bejdses straks ved ankomst til matriklen. Så kan jeg teste sæsonens blomster og fryse/tørre, hvis de viser sig interessante; og nogengange selv om de ikke gør. For det meste medfører det at jeg allerede har det garn, de passer til det projekt, der falder mig ind. Jeg må vist gøre alvor af at lave en farvehave til sommer. Blå har jeg opgivet – for meget bøvl. Men ellers vil jeg genoptage “dogmefarvningen”: Kun alunbejdset garn farvet med enten ting, jeg selv dyrker eller kan finde i omegnen. For eksempel gider jeg ikke rigtig at dyrke Lugtløs kamille eller tagrør for. 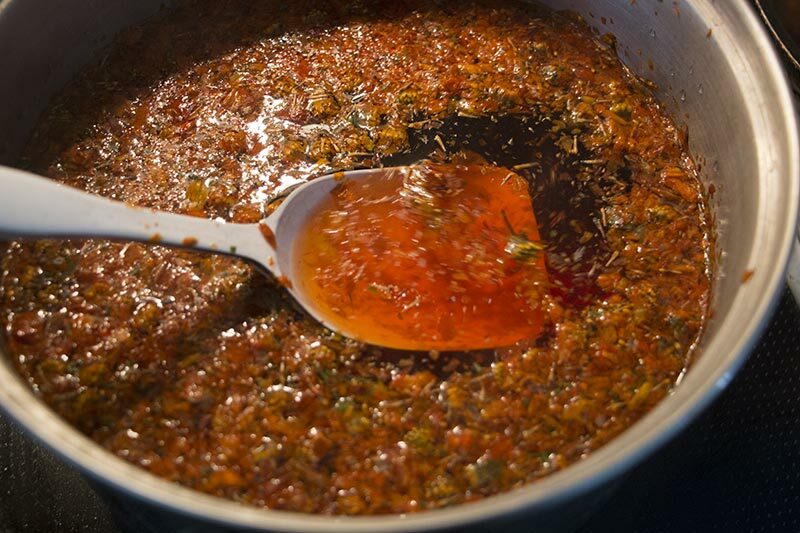 Lige netop de to kan jo ikke fryses eller tørres, men jeg har en plan om frysning af farvesuppe for at se, om det duer. Q – Beautiful! Such a vibrant orange. 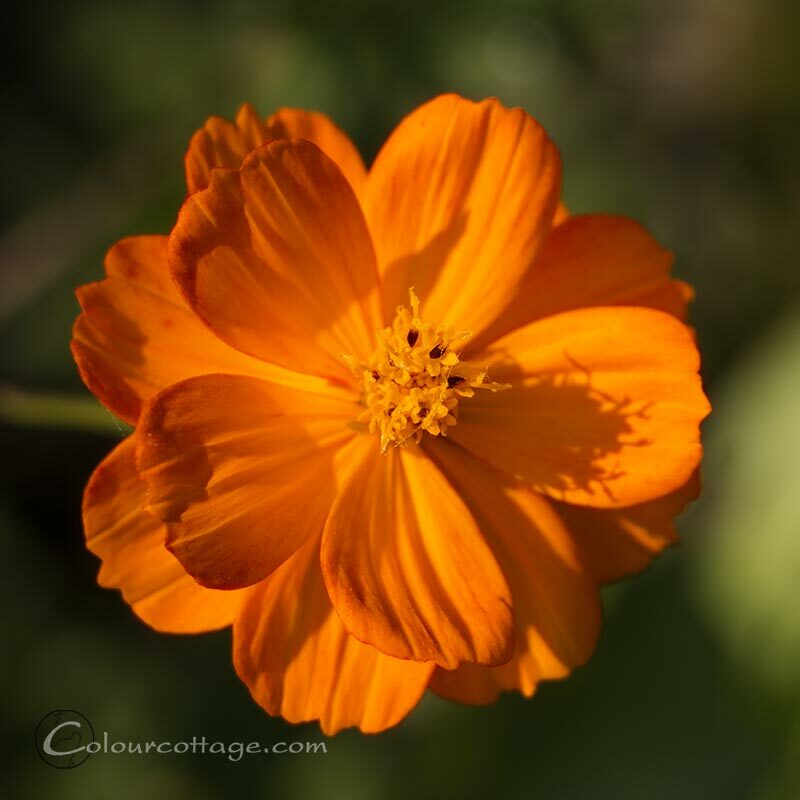 We grow orange coreopsis every year, my husband and I love it. I’m going to use some petals for dying this year! Interesting, I have never dyed with flowers yet. Next summer I will give freezing flowers a try. I also want to try some cellulose fiber, but I have been quite unsure about how to mordant them. Very interesting experiment. 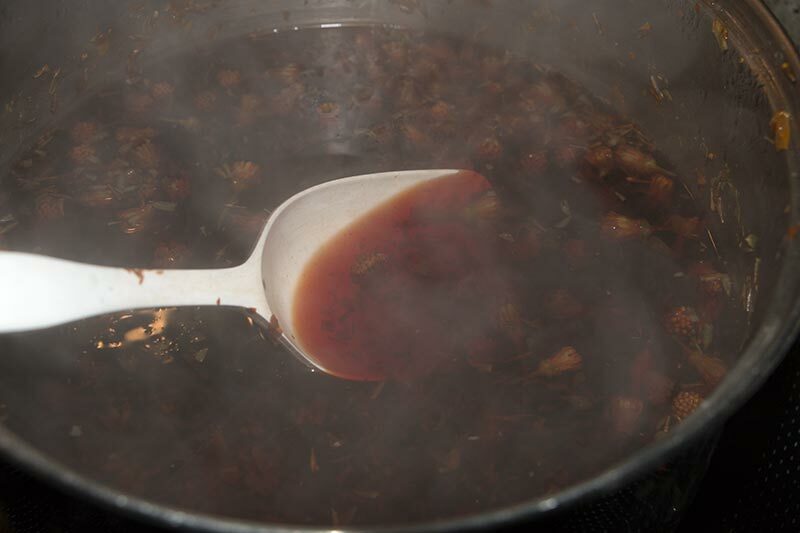 Most garden flowers are useless for dyeing, even if you can make pink water from them. It just doesn’t jump to the yarn. Beautiful colors and as always I am in awe of your abilities in the ‘kitchen’. I am thinking if we lived in the same neighborhood we would make a good team. I can organize, but am freaked by responsibility for almost anything that happens on the stove top and did not come out of a box. Dejlige farver! Også fra dine coreopsis/skønhedsøje eksperimenter. Cosmos har jeg ikke i min plantefarvehave – men den er da værd at overveje, den er jo også yndig.